Although I had the opportunity to take a course on “Evolution and Behaviour” during my undergraduate degree, I chose other options instead, including physiology, pathology and (bio)chemistry. Therefore it’s interesting to me how evolution happened on a smaller scale, namely at the level of the molecules that make our cells do what they normally do: DNA – RNA – proteins. However, cells have not always existed and neither have these molecules. A prominent theory suggests that of those three, RNA evolved first and acted both as an entity that can store information (much like DNA does today) and as a catalyst to drive reactions. This is known as the “RNA world hypothesis” (for a recent review, see Higgs & Lehman, 2015). Although modern cells mainly use proteins to carry out chemical reactions, RNA is still necessary for some very important reactions, including RNA splicing (a necessary part of gene expression in eukaryotes) and protein formation. 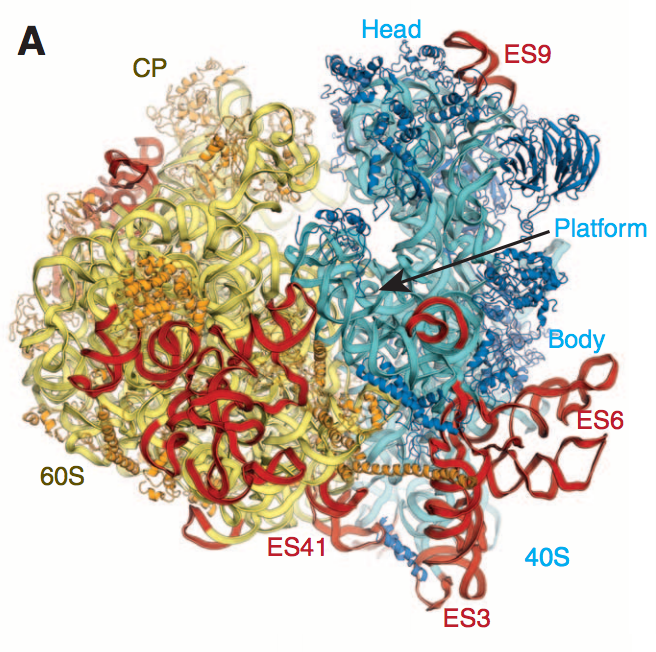 The ribosome is so large that it proved difficult to study, but when crystal structures finally became available this work was rewarded with the Nobel prize for Chemistry in 2009 (Venkatraman Ramakrishnan, Ada Yonath and Thomas A. Steitz). 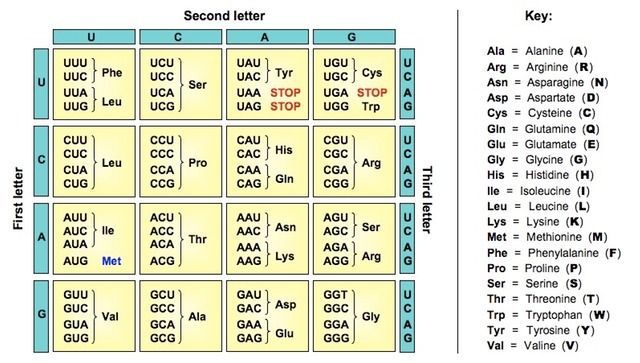 Table of the genetic code – copied directly from here. If one looks at this table a bit more closely it becomes obvious that the code is not random. For example, the amino acid glycine (bottom right) is encoded by four triplets that each start with two guanines, and valine (bottom left) always has G-U at the beginning of its triplets. In theory there are 1.5 x 10^84 possible ways of arranging this table – for comparison, there are approximately 4 x 10^80 atoms in the observable universe – and therefore it is extremely unlikely that the code used today arose by chance. So how did the genetic code evolve? As in most of science there are several competing, but not necessarily mutually exclusive hypotheses about this. One of them argues that the code arose by natural selection so that mutations at the third base of a triplet would not change the protein sequence. For example, if the DNA sequence GGT were mutated into GGA this would not change the glycine at that position. The code provides robustness to an organism whose DNA is constantly being damaged/mutated. Some scientists therefore propose that the triplet code was originally a quadruplet code – increasing the so-called redundancy – which would have allowed for even more DNA damage without changing the amino acid sequence within a protein. There are other theories too. Can you think of any? Stay tuned for some exciting news because, yes, there is a good reason that I am writing about this topic and not the more usual CRISPR/cancer. This entry was posted in Factual, Opinion, Publications and tagged evolution, genetic code, RNA world by Victoria Wang. Bookmark the permalink.